Late last year, we had the pleasure of working with this young woman to capture some images of her in her last few weeks of high school. It was senior portrait time and so we went out to visit Kinder Farm Park, which is a great location with a nice mix of well-groomed landscapes and rustic looking buildings. Our subject for the day was a ready for anything, and brought her own joyful sense of levity and humor to the session which comes through in more than a few of these images. 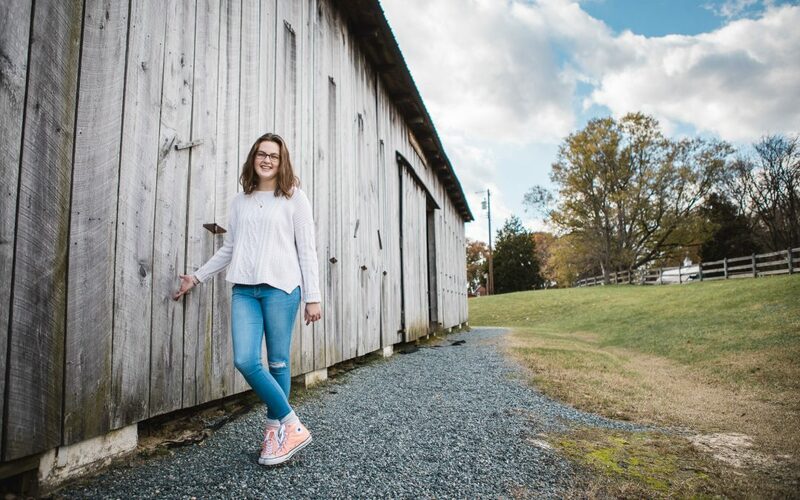 At Petruzzo Photography, “Senior Portrait Sessions” are called “Personality Portraits”, and they’re not just for graduating seniors, they’re also for anyone who needs portraits just of themselves. That might be pregnant mothers, proud parents, fitness enthusiasts, or even just someone looking to build some self-esteem or confidence. We always approach these kinds of sessions as an adventure, trying to get to know our subject and draw out parts of their personality that just wouldn’t come out in response to someone shouting “say cheese!” (In other news, never say that). This session was no different. We had a great time visiting a variety of locations around the park, and we especially enjoyed the ribbon lights cutting through the slats in the barn as the sun began to set. If you’d like to create some senior portraits, check out the Personality Portraits page here on our website for more information!